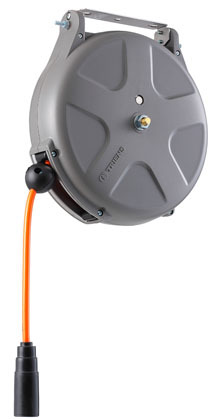 Spring Driven air hose reel. Reliability and Results. Triens new redesign standard series. Redesigned bracket arms for added safety and support. Redesigned inner unit made it possible to roll up more hose and make the cover size smaller. 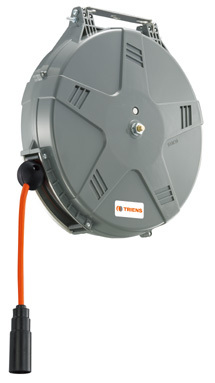 compact and light weight, ideal for space restricted installations. Triens Signature series poly urethane braid hose. Redesigned steel ratchet and gears for long life. Easy couplings – makes replacing hose fast and easy. TRIENS’ quick repair outlet fitting. 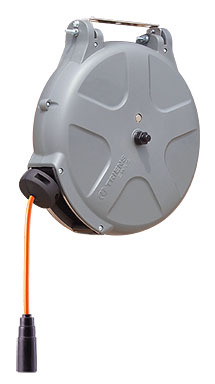 Easy coupling - makes replacing hose fast and easy. Perfect where longer hose length is required. SHS-235A U PU NPT1/4"M 1/4"
[6.5] 35.0 203 NPT1/4"M 2.6 12-3/8"
[8.0] 50.0 203 NPT3/8"M 3.2 14 13/32"
SHR-350 U PU NPT1/4"M 5/16"
[8.0] 50.0 203 NPT3/8"M 3.2 16-1/16"